If Christian scholars would conduct a truly unbiased study of the Holy Scriptures concerning the prophesied Savior, they would find, as many who seek Scriptural truth have, that the prophesied Savior is NOT the savior proclaimed by the Christian world today. The prophesied Savior did indeed come, and He actually did live and die, as the prophets accurately foretold. The true Savior, according to Scriptural prophecy, would have lived and died before the temple and the city of Jerusalem were destroyed in 70 c.e. We will study Volumes One and Two of the Book of Yahweh, which are commonly known as the Old and New Testaments; concerning the prophesied Savior Who the prophets and apostles presented to us. We will also study the so-called savior Christianity promotes. Most importantly, we will enable the reader to learn, from his very own Bible, the identity of the true Savior. Let us first examine the prophesied Savior the prophets and apostles proclaimed—the true Savior. One of the first things we should learn in our search for the true Savior is His Name. The importance of knowing this Man’s Name cannot be overstated. Names were and are very important to the Hebrew people, and their meanings are of great significance, not only to individuals, but also to entire families. The name Jesus is an invention of man which in no way carries the meaning of the true Name of this Man mentioned in the New Testament. The simple fact (which is easily proven from authoritative sources) is that this man was born a Hebrew and He had a Hebrew name. There is no such name as Jesus in the Hebrew language. 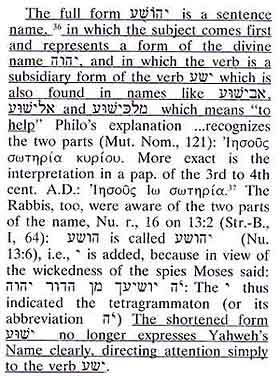 Reading from The Encyclopedia Judaica, Volume 10, page 10, we find that the supposed name Jesus is actually the common Greek form of the Hebrew name Joshua. JESUS (d. 30 c.e. ), whom Christianity sees as its founder and object of faith, was a Jew who lived toward the end of the Second Commonwealth period. THE NAME, BIRTH, AND DEATH DATE OF JESUS. Jesus is the common Greek form of the Hebrew name Joshua. Jesus’ father, Joseph, his mother, Mary (in Heb. Miriam), and his brothers James (in Heb. Yaaqob), Joses (Yahseph), Judah, and Simon (Mark 6:3) likewise bore very popular Hebrew names. The Encyclopedia Judaica, Volume 12, page 805, gives us additional information, concerning the Hebrew spelling of Joshua, which is yod-heh-waw-shin-ayin.
. The Name Yahshua follows the common practice among the true worshippers of Yahweh, in forming and using compound names which brought glory to Yahweh’s Name. A distinctive characteristic of Bible onomatology is the frequency of composite names, which form at times even complete sentences, as in the case of Isaiah’s son Shear-jashub (=”the remnant shall return”). There is an increasing tendency, especially in the 7th Century b.c. to use compound names which state a fact or express a wish… The most numerous are names compounded with ‘YAH’… which number over 150 and are almost entirely personal or family names. The Name Yahshua is just such a compound Name. It is a combination of Yahweh’s Name in a personal name (YAH: yod-heh) and SHUA (shin-ayin), which means salvation. 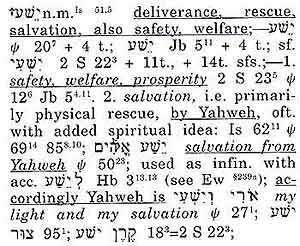 The Hebrew-English Lexicon of the Old Testament, by Brown, Driver, and Briggs, page 221, tells us that the Name Yahshua means Yahweh is salvation. The Hebrew-English Lexicon of the Old Testament, by Brown, Driver, and Briggs, page 447, tells us about the word yasha. + (yod-heh-waw-shin-ayin). This name is correctly pronounced YAH-SHU-A, since the letter waw in this compound is silent, just as The Hebraic Tongue Restored, by Fabre d’Olivet, pages 112-113, tells us. Conjunctive or Convertible Article.–-This article in uniting nouns, causes the movement of nothingness, of which the character W becomes the sign, as we have seen: in making actions pass from one time to another, it exercises upon them the convertible faculty of which this same character is the universal emblem. Its conjunctive movement can be rendered by: and, also, thus, then, afterward, that, etc. But its convertible movement is not expressible in our tongue and I do not know of any in which it can be expressed. In order to perceive it one must feel the Hebraic genius. We have sufficient proof showing that the Name of Yahweh has been completely erased from the Holy Scriptures, and from common knowledge and use altogether, because of the man-made traditions of our forefathers and rabbis. The Century Bible, Volume 1, pages 90-91, tells us the following. The Prophet Yeremyah warned that this practice of removing Yahweh’s Name would be handed down to us from the unfaithful priests, interpreters and scribes, when the Hebrew Scriptures were first translated to Greek, then to Latin, and finally to English. How can you say; We are the wise, and the Law of Yahweh is with us? Behold, the lying pen of the scribes has falsified them, and written them wrong! That’s why, today, we have foolish sounding names like “Jesus”,’ which do not honor or glorify our Heavenly Father Yahweh, because they carry none of the original intent and meaning. The Dictionary of New Testament Theology, Volume 2, pages 330-331, gives us more information about this widely accepted, yet incorrect name. OT Ie-sous is the Gk. form of the OT Jewish name Ye-šûa`, arrived at by transcribing the Heb. and adding an -s to the nom. to facilitate declension. Ye-šûa` (Joshua) seems to have come into general use about the time of the Babylonian exile in place of the older Yehôsûa . The LXX rendered both the ancient and more recent forms of the name uniformly as Ie-sous… It is the oldest name containing the devine name Yahweh, and means “Yahweh is help” or “Yahweh is salvation” (cf. the vb. yasa`, help, save). Joshua also appears in one post-exilic passage in the Heb. ot (Neh. 8:17) as Ye-šûa` the son of Nun, and not as in the older texts Yehôšoa. Jesua. In the last few centuries before Christ the personal name, yos­­a was pronounced and written as yeš­a. The Harper Bible Dictionary, by Paul Achtemeier, page 474, shows us that the form Yeshua or Jesus is not even a Hebrew name. Jeshua (jesh´oo-uh; Heb., “Yahweh is salvation”), the Aramaic form of Joshua. Rather than this name being correctly written and spoken YAHSHUA (containing Yahweh’s powerful Name), its new form was Yeshua, meaning He will save. 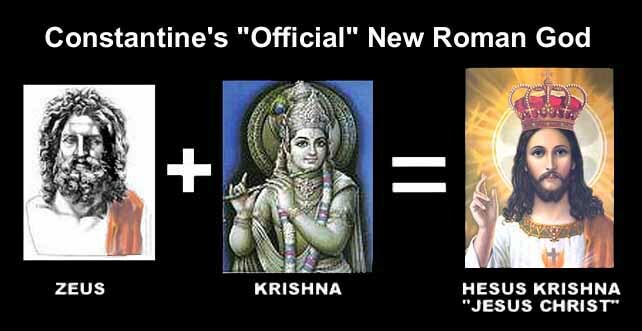 Not only was Yahweh’s Name removed from the correct Name, Yahshua written in its new form, Yeshua, but Yahweh’s power was removed from it as well. – a direct transliteration of the Hebrew word Yeshua. The next version of the Bible, after the Greek Septuagint (LXX), was the Vulgate—attributed to Jerome. In the year 383 C.E., Jerome began to work on this Latin Version. He undertook the revision of the Old Testament directly from the Septuagint Version. Unger’s Bible Dictionary, page 1113, tells us of the earliest, early Versions of the translated English Bibles. 1. Early Versions. There were portions of the Bible, and possibly the entire work, rendered into the English vernacular very early in the history of the language. These, however, were all made from the Latin, and not from the original Hebrew. The early Versions directly translated the Latin word Dominus to the modern English word we all know today as Lord, which is still causing the world to forget Yahweh’s Name for Baal (Yeremyah 23:27). In early versions, the Greek word Ie-sous was shortened to the Latin Iesus. It was not until the year 1064 C.E. that the popular name Jesus, was placed in the Scriptures. There was not even a “J” sound in the English language until that century. We must remember also, the fact that there is no “J” in the Hebrew language. Even the modern English “J” was not in use until the sixteenth century of our own Common Era. The name Jesus is not even a transliteration. It is a corruption of a transliteration of a Hebrew word which had the mighty and powerful Name of Yahweh removed from its original meaning. ). Keep in mind, however, that this name Jesus carries none of the meaning of the original Hebrew Name Yahshua, which means Yahweh is salvation. 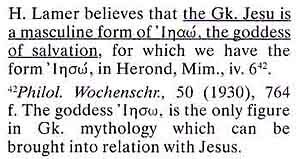 In fact, on page 290, this same work not only tells us that the name “Jesus” fails to convey any of the glory of Yahweh (which is contained in the Name Yahshua), but also that it is actually the masculine form of the name of a pagan Goddess. Up until the First Council of Nicaea, the Roman aristocracy primarily worshipped two Greek gods_Apollo and Zeus_but the great bulk of common people idolised either Julius Caesar or Mithras (The Romanised version of the Persian deity Mithra). Caesar was deified by the Roman Senate after his death (15 March 44 bc) and subsequently venerated as “the Divine Julius”. The word “Saviour” was affixed to his name, its literal meaning being “one who sows the seed”, i.e., he was a phallic god. Julius Caesar was hailed as “God made manifest and universal Saviour of human life”, and his successor Augustus was called the “ancestral God and Saviour of the whole human race” (Man and his Gods, Homer Smith, Little, Brown & Co., Boston, 1952). Emperor Nero (54-68), whose original name was Lucius Domitius Ahenobarbus (37-68), was immortalised on his coins as the “Saviour of mankind” (ibid.). The Divine Julius as Roman Saviour and “Father of the Empire” was considered “God” among the Roman rabble for more than 300 years. He was the deity in some Western presbyters’ texts, but was not recognised in Eastern or Oriental writings. If the Christians could turn the Name of a man, Yahshua, Who all authorities agree was a righteous Man, and Whose Name glorifies Yahweh, into the name of a detestable pagan God (Jesus), then how much more could they twist this Man’s teachings to say that He taught against Yahweh’s Laws? The shocking fact is that the Christians (led by the Catholic Church) have accomplished both of these things, and have convinced the whole world (including the vast majority of Israylites) that these lies are truth. I challenge you to believe Yahweh and His Word, instead of believing lying preachers who desire to “do away” with Yahweh’s Laws – the very Laws (as we have seen) that will bring peace, joy and eternal life to all who abide by them. The truth about this lying propaganda comes as a complete surprise to the Christian believers who will not study for themselves. To them, everything in the Scriptures is a surprise. It’s just like the teaching of their preachers, that Yahshua (Whom they call Jesus) and the twelve disciples “did away” with the Laws of Yahweh in the New Testament teachings. We, should be above accepting as facts the words of lying propaganda, without checking these teachings out for ourselves, with what the Scriptures themselves truly state. One of the most cherished ideas of the pagans, absorbed by the Christians, was that of the trinity of Gods. The savior whom the entire Christian world worships at this time is nothing more than the continuation of the pagan trinity. The fact that this doctrine did not officially become formulated until centuries after Yahshua’s death, attests to the fact that this doctrine does not come from Yahweh’s Laws and prophets. TRINITY. The word Trinity is not found in the Bible, and though used by Tertullian in the last decade of the 2nd century, it did not find a place formally in the theology of the church till the 4th century. It is, however, the distinctive and all-comprehensive doctrine of the Christian faith. It makes three affirmations: that there is but one God, that the Father, the Son, and the Spirit is each God, and that the Father, the Son, and the Spirit is each a distinct Person. In this form it has become the faith of the church since it received its first full formulation at the hands of Tertullian Athanasius and Augustine. TRINITY, in Christian doctrine, the unity of Father, Son, and Holy Spirit as three persons in one Godhead. Neither the word Trinity nor the explicit doctrine appears in the New Testament, nor did Jesus and his followers intend to contradict the Shema in the Old Testament: “Hear, O Israel: The Lord our God is one Lord” (Deuteronomy 6:4). The doctrine developed gradually over several centuries and through many controversies. TRINITY (Ch). The Dogma, formulated authoritatively in fourth century church Councils, that Christians worship one God in three persons (Father, Son, Holy Spirit) and one substance. Under pressure to explain to a hostile Roman world how Christians counted themselves monotheists, Christian apologists (notably Justin Martyr, d. 165) combined Johannine and Stoic-Platonic understanding of the term Logos (“Reason,” or “Word”) in order to maintain that the Son was both God’s own self-expression and a being distinct from him. We see that the term logos was defined by the Christians according to the interpretations of pagan influenced philosophers in order to promote a false pagan God-savior in the Encyclopedia Britannica, Volume 7, page 449. LOGOS (Greek:”word,”reason, or plan“), plural logoi, in Greek philosophy and theology, the divine reason implicit in the cosmos, ordering it and giving it form and meaning. Though the concept defined by the term logos is found in Greek, Indian, Egyptian, and Persian philosophical and theological systems, it became particularly significant in Christian writings and doctrines to describe or define the role of Jesus Christ as the principle of God active in the creation and the continuation structuring of the cosmos and in revealing the divine plan of salvation to man. It thus underlies the basic Christian doctrine of the pre-existence of Jesus. The identification of Jesus with the logos was further developed in the early church but more on the basis of Greek philosophical ideas than on Old Testament motifs. Many of the theories of Egyptian religion, modified and transformed no doubt, have penetrated into the theology of Christian Europe, and form, as it were, part of the woof in the web of modern religious thought. Christian theology was largely organized and nurtured in the schools of Alexandria, and Alexandria was not only the meetingplace of East and West, it was also the place where the decrepit theology of Egypt was revivified by contact with the speculative philosophy of Greece. Perhaps, however, the indebtedness of Christian theological theory to ancient Egyptian dogma is nowhere more striking than in the doctrine of the Trinity. The very terms used of it by Christian theologians meet us again in the inscriptions and papyri of Egypt. Originally the trinity was a triad like those we find in Babylonian mythology. The triad consisted of a divine father, wife, and son. The father became the son and the son the father through all time, and of both alike the mother was but another form. The trinity consisted of the god Serapis (=Osiris+Apis), the goddess Isis (=Hathor, the cow-moon goddess), and the child-god Horus. In one way or another almost every other god was identified with one or other of these three aspects of the one god, even the sun god Mithras of the Persians. And they were each other; they were three, but they were also one. Among the systems offering an explanation of the world in terms of the logos, there are the Mystery Religions. These cultic communities did not see their task as lying in the communication of knowledge of a scientific nature, but of mysteries to their initiates who strove for purification in the recurrent enactment of sacred actions. The Foundation for these cultic actions was Sacred Text. Among them were the cults of Dionysus, the Pytha-goreans, and the Orphic Mysteries. By means of these cults, non- Greek thought, such as in the Isis-Osiris Mysteries, which Osiris— the logos created by Isis7 is the spiritual image of the world. Similarly in the cult of Hermes, Hermes informed his son Tat in the Sacred Text belonging to the cult, how by God’s mercy, he became logos, and thus a son of God. As such, he (Hermes) brought regulation and form into world, but himself remained a mediating being between God and matter, on one side, and God and man on the other. The logos can also, however, appear as the son of Hermes, resulting in a triple (trinity) gradation: God (who is Zeus), Son (Hermes), and LOGOS. The Encyclopedia Judaica, Volume 5, page 509, tells us that there is NO VALID REASON FOR DOUBTING the HISTORICAL REALITY of Yahshua. There is no valid reason for doubting his historical reality or assuming him to be a purely mythical figure. There is, however, great reason to doubt what the Christians say about Him. As we have read and proven so far, paganism, not the Laws of Yahweh, is the driving force of Christianity. The Encyclopedia Judaica, Volume 5, page 511, admits this fact. With its spread among the gentiles, the pagan characteristics of Christianity gained in influence, and after Constantine the Great and the adoption of Christianity as the official religion of the Roman Empire, the traditional Hellenistic-pagan forms of civic, social, and cultural anti-Semitism (see *Apion) merged with the specifically Christian theological motifs to form an amalgam that has left a tragic legacy to history. In this tragic legacy to history left by Christianity, the most tragic has been the twisting of the Holy Scriptures to fit pagan doctrines, beliefs and philosophy; rather than allowing them to fit Yahweh’s Laws and prophets, the way they were originally written. The Encyclopedia Judaica, Volume 10, page 10, acknowledges that this is exactly what the church has done. Both of the chief sources of the Synoptic Gospels, the old account, and the collection of Jesus’ sayings, were produced in the primitive Christian congregation in Jerusalem, and were translated into Greek from Aramaic or Hebrew. They contained the picture of Jesus as seen by the disciples who knew him. The present Gospels are redactions of these two sources, which were often changed as a result of ecclesiastical tendentiousness. Most shocking of all, the Roman Catholic Church herself admits to the forgery of the Holy Scriptures. The Catholic Encyclopedia, Volume 6, page 136, gives us this admission. “Substitution of false documents and tampering with genuine ones was quite a trade in the Middle Ages. Innocent III (1198) points out nine species of forgery[of ecclesiastical records] which had come under his notice. So by forging, altering, and changing the Holy Scriptures, including the inspired record of Yahshua’s teachings, Christianity has brought forth a pagan God-savior and a way of life in complete opposition to Yahweh’s Laws. One of the greatest pagan deceptions ever passed off to this world as truth by the Roman Catholic Church is that of a pre-existent God-savior who is part of a trinity of Gods. This very idea is pagan in origin. We will now see how the Christians twisted The Holy Scriptures to get away with it. The Encyclopedia Judaica, Volume 12, page 1061, agrees that the original versions of Volume Two of the Holy Scriptures did not teach a pre-existent God-savior. The spirit of Judaism is discernible even in the compositions originally written in this popular Greek. The New Testament is still far removed from the absolute deification of Jesus, and even more so from the LATER idea of the Trinity. We will now examine some of the Scriptures the Christians were “forced” to twist and mistranslate in order to deceive their followers. One thing is certain though, they were not able to twist all of them and there are plenty of Scriptures that contradict the “Pre-Existence Fraud,” even in the King James Version. There is nothing recorded in Volume Two of the Holy Scriptures that ever quotes Yahshua as saying He was either an equal part of a trinity with Yahweh or that He pre-existed with Yahweh. On the contrary, everything Yahshua spoke showed He was in complete submission to His Heavenly Father Yahweh and to His Laws, as we all should be. Yahshua taught the Law of Yahweh exclusively, and Yahweh’s Law teaches that Yahweh is one and that we are to serve and worship Yahweh only. 28 Then one of the scribes came, and listened to all their discussion, and had noted how well He answered. So he asked Him; What is the first commandment of all? Yahweh your Father you must reverence, and Him you must serve, and by His Name you must take your oaths. And you must not pray to or worship any man on earth as a “Father,” for you have only One Father, Who is in heaven. You have heard that I told you: I go away, but come again to you. If you loved Me, you would have rejoiced that I am going to the Father, for the Father is greater than I. 17 But He said to him: Why do you question Me about righteousness? There is only One Who is the standard of perfection, and that is Yahweh; so if you would enter into life, keep the Laws of Yahweh . The apostles taught that Yahshua was a mortal man, not a pre-existent God-savior. They taught that He was tempted like all men are tempted. For we do not have a High Priest Who cannot sympathize with our weaknesses, but was in all ways tempted as we are—yet was without sin. They also taught that Yahweh, however, cannot be tempted. The apostles also taught that Yahshua died. Then Yahshua cried with a loud voice, and died. The apostles also taught that Yahweh raised Yahshua from the dead. This Yahshua, has Yahweh raised up, and of this we are all witnesses! It is a Scriptural fact that Yahweh is immortal, that He cannot die. So if Yahweh and Yahshua are the same being (as Christianity teaches) how could one die and the other live to raise the one who died? This simply makes no sense, but neither does any Christian doctrine. Notice what the Apostle Shaul wrote, speaking of Yahweh. In this verse, we also read that no man has ever seen Yahweh, yet Yahshua most definitely was seen. In order to justify their claim that Yahshua is Yahweh and that He pre-existed with Yahweh, the Christians quote the following Scripture from the King James Version. The word word in these verses comes from the Greek word logos. The Christians, so eager to promote the pagan Trinity, attached to the word every pagan interpretation. But they deliberately ignore the fact that Yahchanan was a Jew who had nothing to do with pagan Greek philosophy. The Wycliffe Bible Encyclopedia, Moody Press, Chicago, IL, Volume 2 pages 1046-1047. gives us the following information. Many scholars have argued that the apostle John had this philosophical development in the back of his mind when he wrote the prologue to his Gospel and that he actually tried to impart some of these concepts. For a long time many have contended that the background of the fourth Gospel was essentially Hellenistic rather than Hebraic. In dealing with such an assertion we may note that studies in the Dead Sea scrolls have tended to confirm the traditional conservative position that the cultural orientation of the Gospel of John was Hebraic. Moreover, we must observe that John was a simple fisherman from Palestine. While he did come to live in the sophisticated city of Ephesus, probably after the fall of Jerusalem in a.d. 70, there is no evidence that he imbibed any of that city’s Gr. philosophical orientation. If he intended to be philosophical in the first few verses, he certainly was not anywhere else. We may argue that John used the word “logos.” which was common in the language of the day, in its ordinary meaning and poured into it a spiritual significance. This source admits that Yahchanan used this word in its ordinary meaning. They further admit that Yahchanan’s writings were Hebraic. The Encyclopedia Judaica, Volume 12, page 1060, admits that the style of most of the writings in Volume Two of the Holy Scriptures is, in fact, Hebraic. THE LANGUAGE OF THE NEW TESTAMENT. Although the language of the New Testament, in the form that it exists today, is Greek, two earlier influences are still discernible. (1) THE INFLUENCE OF THE ARAMAIC-HEBREW ORIGINAL. Because most of the authors were Jewish Nazarenes, they spoke, for the most part, Aramaic, and some also mishnaic Hebrew. This influence, which was detectable particularly in the original versions of Mark and Matthew, survives to some degree in their extant Greek versions and in several of the Epistles as well, including James and Jude. The rest of the works were originally written in Greek. Since this translation was used by many authors, the New Testament contains not only Aramaic words and phrases, which the disciples heard from Jesus and took care to remember out of reverence for their master (e.g. Talitha Kumi (Mark 5:41), Kum, Rabboni, Eli, Eli (Elohi, Elohi) lama sabachthani (Matt. 27:46; Mark 15:24)), but also expressions and phrases which retain their Hebrew flavor although they were transmitted through the Greek translation of the Hebrew Bible. So to assert that the Apostle Yahchanan was writing of a pagan logos is absurd. The word logos in its ordinary meaning comes from the Hebrew word dabar as Thayer’s Greek-English Lexicon of the New Testament, page 380 shows. A Hebrew and Chaldee Lexicon to the Old Testament, by Julius Furst, page 312 shows us that the Hebrew word dabar refers to Yahweh’s Plan and His Laws. So Yahchanan wrote, under inspiration, not of a pre-existent God-savior, but of the wonderful Plan of Yahweh. The Anchor Bible, Ephesians 1-3, page 111, shows us from the Talmud that seven things were in Yahweh’s mind, His Plan, from the beginning and this plan included the Savior. IN THE TALMUD tractate Pesachim 54a; cf. Nedarim 39b, seven things, i.e. the law, repentance, paradise, Gehinnom, the throne of glory, the heavenly sanctuary, and the messiah are not called pre-created, but pre-conceived in (Yahweh’s) thoughts. With all this in mind, let us read the correct translation of the following Scripture. The Law of Yahweh, which Yahshua and the apostles preached, plainly tells us that Yahweh is one. The prophets further testified that Yahweh is the only source of power and there is no pagan God with Him at all. It should now be obvious to anyone that the apostles, as well as the prophets, did not believe in or teach a pre-existent God-savior. The apostles clearly taught against pagan Godworship, the same worship all Christianity teaches today. 25 Who exchanged the truth of Yahweh for the Lie; Lords (Baalim), Gods, and Goddesses (Elohim), and worshiped and served the creation, rather than the creator, Who is blessed forever. Praise Yahweh! HalleluYahweh! 22 Do we provoke Yahweh to jealousy? are we stronger than He ? 14 Do not be unequally yoked together with unbelievers. For what fellowship has righteousness with unright-eousness? and what fellowship does light have with darkness? 18 We know that whoever is born of Yahweh does not sin; but he who has been begotten of Yahweh keeps himself, and the evil one does not touch him. 19 We know that we belong to Yahweh, and that the whole world is under the control of the evil one. 20 And we know that the Son of Yahweh has come, and has given us an understanding, in order that we may know Him Who is true; and we are in Him Who is true, for we are in His Son, Yahshua. Yahweh is the true Father, and eternal life. 21 Little children, keep yourselves from the defilement of Gods (elohim). 3 Gor all nations have drunk of the wine of the wrath of her fornication, and the kings of the earth have committed fornication with her, and the merchants of the earth have grown rich through the abundance of her delicacies. However, the apostles knew Yahweh’s Plan which called for a man to be born who would be sacrificed for the past sins of many. They also knew that this man would be raised again by Yahweh. Some of those trying to support the deception of a pre-existent savior argue that Yahshua and Yahweh are the same being. They also argue that Yahshua was Yahweh of the Old Testament. These arguments held up to the light of the Scriptures plainly show that Yahshua and Yahweh are two different Beings. Who raised Yahshua from the dead? It was Yahweh the Father. The Scriptures say that it is Yahweh Who raises the dead. Yahshua could not raise Himself, since the Scriptures say that He was the One Who was dead. It takes the power of someone who is alive and who has power over death to raise a person from the dead. In Acts 3:15, we are emphatically told that Someone was Yahweh, the Father of Abraham, Isaac, and Yaaqob. This should prove to anyone that Yahweh and Yahshua Messiah are two different beings. And for this reason He is the mediator of the renewed covenant, under which, through the means of death to bring redemption from transgressions committed under the covenant, the first who are called may receive the promise of the eternal inheritance. This Scripture tells us, plainly, that because Yahshua Messiah was willing to give up His life for the Plan of Yahweh, He became the Mediator of the renewed Covenant. Any reliable dictionary will tell you that the word death used in Hebrews 9:15, means the act of dying; permanent ending of all life in a person, animal, or plant. The Holy Scriptures also confirm the fact that to become dead means to become senseless. It is a Scriptural fact that one who is dead does not even know that he is dead. Yahshua Messiah did not know anything during the three days and three nights He was dead. Therefore, He most certainly did not raise Himself from the dead. Yahshua Messiah did die; all life ceased to exist in His body. He was dead for three days and three nights. Yahweh, however, was alive; Yahweh is immortal. Yahweh cannot die. Yahweh could not have been Yahshua, because the Holy Scriptures say that Yahshua died. The word mortal from The New World Dictionary of the American Language, comes from the word mortis, which means death, akin to the word mori, which means to die. Therefore, Yahshua Messiah was mortal. Yahshua Messiah died. The word immortal from this same dictionary, means not mortal; deathless. Yahweh is immortal. Yahweh could not have died. Dying is an impossibility for an immortal being. Yahshua Messiah was not immortal at that time. He was made subject to death. But we see Yahshua, Who also was made a little lower than the malakim, crowned with glory and honor because of His having suffered death, in order that He, through the love of Yahweh, might taste death for everyone. Yahshua died; Yahshua suffered death, proving by His dying that He was not an immortal, pre-existent Being. 9 But you took Me from My mother’s womb, Yahweh! You made Me trust in You, even from My mother’s breast. 10 I was cast upon You from My birth; from My mother’s womb, You are My Strength. he Dictionary of Old Testament Words for English Readers, says that the Hebrew letter, mem, which has been circled in the previous copy, is prefixed to a substantive, which denotes the preposition. 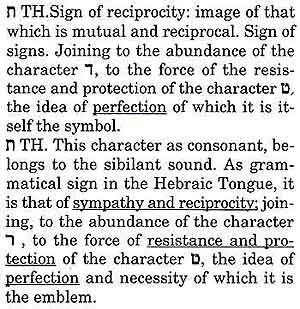 However, it is The Hebraic Tongue Restored, by Fabre d’Olivet, which tells us what these prepositions mean when the Hebrew letter mem is prefixed. EXTRACTIVE OR PARTITIVE ARTICLE.__The movement which this article expresses, with nouns or actions that it modifies, is that by which a noun or an action is taken for the means, for the instrument, by which they are divided in their essence, or drawn from the midst of several other nouns or similar actions. I render it ordinarily by from, out of, by; with, by means of, among, between, etc. The New World Dictionary of the American Language, Second College Edition, gives a complete definition of the word from as beginning at, starting with, out of. The word translated from in Psalm 22:10, means beginning at, starting with. Yahshua is prophetically pictured through King David to say that Yahweh was His strength from the beginning, starting with the point Yahshua Messiah was conceived in His mother’s womb. Yahweh was Yahshua’s strength. This can only mean one thing: that before Yahshua was in His mother’s womb, Yahweh was not His strength, because Yahshua did not yet exist. He had no need of strength. Yahweh was only Yahshua’s strength, beginning at, starting with, His mother’s womb. Most people in this world do not realize the importance of understanding and believing exactly what Yahweh says about Yahshua’s beginning. To believe in a pre-existent savior is just as detrimental to our salvation as believing in a savior other than Yahshua Messiah, Who was sent by Yahweh. As incredible as it may sound, the doctrine of a pre-existent savior was being taught even before Yahshua Messiah was born. This doctrine was condemned by the apostles. The apostles called those who taught it anti-Messiahs. For many deceivers are entered into the world, who confess not that Jesus Christ is come in the flesh. This is a deceiver and an anti-christ. The word translated come in this Scripture is word #2064 in Strong’s Greek Dictionary, the word erchomai, and means to come or go in a great variety of applications. 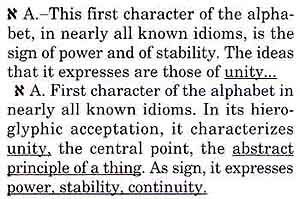 The Greek-English Lexicon by Liddell and Scott, Oxford tells us that this Greek word means to start. Thayer’s Greek-English Lexicon shows the Greek word #2064, erchomai on pages 250-251 and shows that one of these definitions means to come into being, arise, come forth, show itself, find place or influence. Then, by reading I Yahchanan 4:2-3, we should realize the importance the apostles placed upon following the Savior sent by Yahweh. However, just by reading this in the King James Version, one would not be able to realize the importance. 3 And every spirit that confesseth not that Jesus is come in the flesh is not of God: and this is that spirit of anti-christ, whereof ye have heard that it should come; and even now already is it in the world. Every place the word come is used in the King James Version of I Yahchanan 4:2-3, it is the same Greek word that was used in II Yahchanan 1:7, the word erchomai. Like the word come in II Yahchanan 1:7, the true meaning of this word in I Yahchanan 4:2-3 is not apparent in the King James Version. However, the meaning of this word becomes clearer when other Scriptures that use the word erchomai are compared. The word translated cometh in Yahchanan 1:9, is also the same Greek word that is translated come in I Yahchanan 4:2-3 and II Yahchanan 1:7 which is rendered erchomai in Strong’s Greek Dictionary. Everyone agrees that for any man to come into the world that man has to begin in the flesh. That is exactly the context of the word cometh in Yahchanan 1:9. For a man, any man, to come into the world, this means that man has to be born. Our Savior sent by Yahweh, Yahshua Messiah, was conceived, which means to start life in the womb. It is vital that we understand how important it is for us to believe in the Savior Who was promised by Yahweh, Who was conceived in His mother’s womb Who was not pre-existent. This understanding about the Savior sent by Yahweh, a Savior Who did not pre-exist, becomes apparent when one understands the true meaning of the Greek word, erchomai, used in II Yahchanan 1:7, I Yahchanan 4:2-3, and Yahchanan 1:9. Little children, this is the last hour; and as you have heard that the Anti-Messiah will come, even now there are many Anti-messiahs; by this we know that this is the last hour. 3 And every spirit that does not confess that Yahshua Messiah started in the flesh is not of Yahweh. So this is the spirit of the Anti-Messiah which you have heard was coming, and is now already in the world. The word translated confess-confesseth in these Scriptures is word #3670 in Strong’s Greek Dictionary, and means to assent, covenant, acknowledge. However, Thayer’s Greek-English Lexicon, clearly states the meaning of this word as to say the same thing, not to refuse, not to deny, to confess, to declare openly and voluntarily implying the yielding or change of one’s conviction, to praise, celebrate. The Apostle Yahchanan was explaining that those who acknowledge that Yahshua Messiah, the Savior sent by Yahweh had an existence beginning in the flesh, which was in the womb of Miriam, are of Yahweh and of the truth. Anyone who does not confess: does not say the same thing, refuses, denies, does not declare openly and voluntarily, and does not praise and celebrate, that Yahshua’s very existence began or originated in the flesh is not of Yahweh. Those who preach the doctrine of a pre-existent savior, most assuredly are proclaiming another Savior, not the one proclaimed through the Holy Scriptures. Therefore, they are anti-Messiah, just as I Yahchanan says. And every spirit that does not confess that Yahshua Messiah started in the flesh is not of Yahweh. So this is the spirit of the anti-Messiah which you have heard was coming , and is now already in the world. Any authoritative Scriptural reference book will give you the following information. Unger’s Bible Dictionary, page 347, tells us of the place and authority of the Father. As you read for yourself, you will find that Yahshua taught His disciples, those who obeyed Yahweh, to pray in the following manner. So He said to them: When you pray, using this example, say: Our Father Who is in heaven, hallowed be; to show reverence and respect to, Your Name. Your Kingdom come. Your will be done; as it is in heaven, so may it be in earth. Asking that the Father of our King, Yahshua Messiah, the Father of glory, may give you the Spirit of wisdom and revelation; unveiling and uncovering truths, for the full knowledge of Him. 6 Yet to us there is only One Authority, the Father, from Whom all things came and for Whom we live. And there is but one King, Yahshua Messiah, on Whose account are all things, and on whose account we live . The Holy Scriptures show that we accept one of two beings as our head. We can either accept Yahweh as our Father (head) or we can accept Satan as our head. Through this world’s lust to break the Laws of Yahweh, they have rejected Yahweh as their Father, while accepting Satan the adversary as their head. By doing this, they have become the people of the devil, as the Apostle Shaul describes in the following Scriptures, because they did not like to retain Yahweh in their knowledge. 27 And the men did the same thing: leaving the natural use of the woman, they burned in their lust for one another; men committing shameful acts with men, and suffering in their own bodies the penalty for their error, which is their fitting retribution. 28 And so, since they did not like to retain Yahweh in their knowledge, Yahweh gave them over to a reprobate mind, to do those things which are not proper. Yahweh blames the false religious leaders, the preachers who are the instruments of Satan, for this worldwide rebellion against Yahweh and His Laws. Notice what the Prophet Yeremyah was inspired to write. 22 But if they had stood in My counsel, and had caused My people to hear My words, the Law and the prophets, then they would have turned them from their evil way, and from the evil of their doings. Yes, if today, the false religious leaders would teach the way of Yahweh, Who is the Father and the Head, the people of this world would be turned from sin, which is the breaking of Yahweh’s Law, as I Yahchanan 3:4 emphatically states, and would be turned to the way of Yahweh. This Scripture cannot be any clearer than it is. This is Yahweh speaking about Himself. In other words Yahshua told Yahchanan not to be afraid, for He was alive forevermore. Yahshua did not identify Himself by that title Alpha and Omega. Then, the phrase Alpha and Omega is again written in Revelation 21:6-7, which is speaking of Yahweh. 7 He that overcometh will inherit all things; and I will be his Father, and he shall be My son. Yahweh is the Father, so it is definitely Yahweh Who is doing the speaking in this prophecy. Now, we come to the Scripture in which the words Alpha and Omega were added, in order to say that Yahshua is the Alpha and Omega. This Scripture is Revelation 22:13. Revelation 22:16 undeniably states that these are Yahshua’s words. 12 And behold, I come quickly, and my reward is with me, to give every man according as his work shall be. 13 I am Alpha and Omega, 117the beginning, and the end, the first and last. 14 Blessed are they that do his commandments, that they may have right to the tree of life, and may enter in through the gates into the cities. 16 I Jesus have sent mine Angel, to testify unto you these things in the Churches. I am the root and the offspring of David, and the bright and morning star. 17 And the Spirit and the Bride say, Come. And let him that heareth, say, Come. And let him that is athirst, come. And whosoever will, let him take the water of life freely. Notice Footnote Number 117, which has been circled in verse 13. The footnote of this Bible, shows that the Alexandrian (NU) and the Vatican (M) texts omit the phrase, Alpha and Omega. 117 NU-Text and M-Text read the First and the Last, the Beginning and the End. Never before has there been a true understanding of what Yahweh actually said when He identified Himself as the first and the last. Since we know that Yahweh said that He is the first and the last in Revelation 21:6, let us thoroughly study the Scriptures to come to Yahweh’s truth. In Revelation 1:8, the Being Who is speaking identifies Himself as the Almighty, Who we all know is Yahweh. Almost all English versions of the Bible render Revelation 1:8 in the same way the King James Version is translated. By merely leaving this text as it is written, a tremendous understanding has been lost. However, if these two Greek letters are researched in detail, one will readily see that Yahweh is revealing much more about Himself than just being the beginning and the end. The Anchor Bible, Revelation Volume 38, page 379, gives us the explanation of this phrase. Adam Clarke, in his Commentary, Volume 6, page 971, agrees that alpha and omega are aleph and tau in Hebrew. [The beginning and the ending.] That is, as aleph or alpha is the beginning of the alphabet, so am I the author and cause of all things; as tau or omega is the end or last letter of the alphabet, so am I the end of all things, the destroyer as well as the establisher of all things. We would not be any better off, however, if this Scripture (Revelation 1:8) is properly rendered: “I am the Aleph and the Tau.” We still would not know what Yahweh means when He identifies Himself by the first and last letters of the Hebrew alphabet, unless this is further researched. The letters aleph and tau must be researched to see if they do have a meaning, or message, to convey. What the Bible translators did not realize (or they rejected) is that each individual Hebrew letter can be a word or phrase unto itself, with a specific meaning. This is clearly pointed out by Fabre d’Olivet in his book, The Hebraic Tongue Restored. Dr. d’Olivet gives clear, precise explanations of the meanings of each individual Hebrew letter, and what they point out or declare. On page 98 of his book, Dr. d’Olivet also states that knowing that each Hebrew letter has a meaning of its own, is the key to understanding the Scriptures. In reference to the letters aleph and tau, Dr. d’Olivet gives clear proof that these two letters make statements in their own right. The first letter in the Hebrew alphabet, as Dr. d’Olivet points out from The Hebraic Tongue Restored on pages 95 and 287, stands for unity. On pages 98 and 465 of this book, Dr. d’Olivet clearly points out that the letter tau, the last letter of the Hebrew alphabet, means and stands for perfection. Incredible as it may sound, both single letters aleph and tau, are in themselves Hebrew words that have specific meanings. As Clark in his Commentary, and the writers of The Anchor Bible, Revelation, have shown, the Alpha and Omega should have been written: the Aleph and the Tau. Now, with the true meanings of these Hebrew letters revealed, all can see the statement that Yahweh is actually making in these Scriptures. I am unity (Aleph) and perfection (Tau), the Beginning and the End, says Yahweh: Who is, and Who was, and Who is to come: the Almighty. Other Scriptures verify that Yahweh is unity and perfection. Hear, O Israyl, Yahweh is our Father. Yahweh is One. Yahshua Messiah, a begotten Son of Yahweh, Who was the Savior sent by Yahweh, taught that Yahweh is perfection. Yahweh is revealing Himself again to be unity and perfection. These Scriptures that reveal the Alpha and Omega, the Aleph and the Tau to be Yahweh Almighty (Revelation 1:8; 1:11; and 21:6) do not point out Yahshua Messiah. Nor can Revelation 22:13, in which this phrase was added, be used to claim that Yahshua Messiah pre-existed. Having proven that the words Alpha and Omega were added to this Scripture, Revelation 22:13, The Book Of Yahweh correctly reads. I am the First and the Last, the Beginning and the End. We know Yahshua said this. We know it is no contradiction for Him to call Himself the last, for He will live forever. We know it is no contradiction for Him to call Himself “the end,” for He is the end result of having kept His Father’s Laws perfectly. For Yahshua is the ultimate result of keeping the Law unto righteousness for everyone who believes. The translators tried to distort this Scripture to try to make you believe that Yahshua Messiah ended the Law. Romans 10:4 taken from the King James Version, shows us how this Scripture has been distorted. If you will research the meanings of the word translated end in this Scripture, then you will see that this word means ultimate, prophetic purpose, and not end as is universally understood in the English context. The word translated end in Romans 10:4, as well as Revelation 22:12 is word #5056, from Strong’s Greek Dictionary and means to set out for a definite point or goal; prop. the point aimed at as a limit, ultimate or prophetic, purpose. Religious imposters also use Romans 10:4 in order to deceive the people in this world into thinking that Shaul taught against Yahweh’s Laws. The Apostle Shaul never once taught against the Law of Yahweh. In fact, he taught all to keep Yahweh’s Law. In the same book of Romans, which Shaul wrote, we find the following Scriptures. For not the hearers of the Law are the righteous in the sight of Yahweh, but the doers of the Law are the righteous. Do you not know that to whom you yield yourselves as servants to obey, his servants you are whom you obey; whether of sin which leads to death, or of obedience which leads to righteousness? There are many Scriptures in the book of Romans, which teach against sin: against breaking the Law of Yahweh (I Yahchanan 3:4). However, these two should be enough to show you that the Apostle Shaul did not teach against the Laws of Yahweh, as the false religious leaders would have you believe. Now, in Revelation 22:13, Yahshua called Himself the “last” because He has been resurrected to eternal life, and now He will never die again. He called Himself the “end” because He is the end product, the ultimate result of keeping the Law of Yahweh. What did He mean when He called Himself the first in Revelation 22:13? Did He mean that He was the first being to ever exist? Many would have you think so. Did He mean that He was the Father of all living? There are some who would have you believe this. Was Yahshua saying that He pre-existed? If you will let Scripture interpret the Scriptures, then understanding will come. And from Yahshua Messiah; the faithful witness, and the firstborn from the dead , and the Ruler of future kings of the earth. To Him Who loved us and freed us from our sins by His own blood. When Yahshua called Himself the first in Revelation 22:13, He made no reference to pre-existence. Yahshua simply meant that He was the firstborn from the dead, which means that He was the first to be raised from the dead and given eternal life. Because Yahshua was raised from the dead, He is now immortal, He was the first to be fully created in the full image of Yahweh. This is what Yahshua meant when He said He was the first, in Revelation 22:13. And to the malak of the congregation of The House of Yahweh in Laodicea, write: These things says the Faithful and the True One, the One testifying of the faith and the truth; the first perfected of Yahweh’s creation. In this Scripture, Yahshua called Himself the beginning of the creation of Yahweh. Yes, man in his present physical state, is only a half-created being, because we are still corruptible flesh, as Shaul said. We are still dying in this world. If you do not believe this, just read the obituaries. Man is only in the likeness of Yahweh at this time; man was created to resemble Yahweh. Man has a form just like Yahweh, a head, a chest, arms, legs and feet, just as Scriptures describe Yahweh as having. However, Yahshua Messiah, because He is the first to be raised from the dead to eternal life, is now in the full image of Yahweh. Yahshua is perfected. He has become the first or the beginning, among men, to reach the state of perfect, completed, whole creation, as Yahweh’s Plan for mankind is. Therefore, He still has no reference to pre-existence in calling Himself the beginning in Revelation 22:13. Yahshua Messiah simply meant that He was the beginning, the first perfected of Yahweh’s whole creation, or plan for man. Yahshua Messiah said the following. No man can come to Me, unless the Father, Who has sent Me, draws him; and I will establish him as a priest at the last day. When we are called out of this world by Yahweh’s Holy Spirit and begin to understand the importance of Yahweh’s Holy Scriptures in our lives, we, even then, are only half of the creation Yahweh requires us to be, in order for us to enter His Kingdom. To understand this, we must understand the Plan of Yahweh. When Yahshua was resurrected from the dead, He became the firstborn of many brothers. When we are conformed to Yahshua we will also be conformed to the Father Yahweh, because Yahshua conformed to be exactly like the Father. The definition of the word conform from Webster’s New World Dictionary of the American Language is to make the same or similar, to bring into harmony or agreement; to be in accord or agreement. In order to receive the reward of eternal life, as Yahshua did, we must be conformed to the same image that Yahshua obtained. The next question is, how did Yahshua obtain this image? Scriptures show that He was not born with this image but through a process, He became the perfect creation of Yahweh. Yahweh’s perfected creation becomes our hope. We will become perfectly created if we overcome, just as Yahshua is the first perfected now. Yahshua is only the beginning, the first. There are many more to be made perfect and to become Yahshua’s brothers, the actual sons of Yahweh. For He is the Head of the body, the called out ones, Who is the beginning of the firstborn from the dead, so that in all things He may have the pre-eminence. Keep in mind what the Apostle Shaul said in Romans 10:4. Yahshua is the ultimate result of keeping the Law of Yahweh. Now, notice the warning recorded for us in the following Scriptures. For your obedience has become known to all. Therefore, I am glad on your behalf, but I want you to be wise in what is righteous and simple, concerning evil . Yahshua Messiah was most definitely persecuted. The thing to understand about these persecutions is that He benefitted from them. Notice what is recorded for our instruction. It is a Scriptural fact that Yahshua Himself learned obedience from the things He suffered. That is, He saw the cruelty of those who did not follow Yahweh’s way, and that impressed upon Yahshua all the more the need for every person’s obedience to Yahweh’s Laws. Yahshua experienced the hatred of those who were disobedient, and through this suffering He came to despise the shame that comes with disobedience. 2 Looking to Yahshua, the first Who was led and perfected by the faith, Who, for the joy that was set before Him: endured the sacrifice, despising The Shame; Bosheth: Baal, Lord, and is set down at the right hand of the throne of Yahweh! Yes, Yahshua suffered because He lived by every Word that proceeded out of the mouth of Yahweh. Because He lived that kind of life in front of the carnally minded, He suffered persecution. But through that persecution He became perfect, because any temptation He experienced quickly disappeared when He saw what was coming from those carnally minded people who persecuted Him. For in that He Himself has suffered, being tempted; tested and tried, He is able to help those who are being tempted. Yes, Yahshua Messiah was tempted. He was human. Therefore, He was subject to temptation. In fact, Yahshua was tempted in every way we are tempted. This one point that Yahshua was tempted in all ways, sets Yahshua apart from Yahweh, because Yahweh cannot be tempted. Let no one say when he is tempted: I am tempted by Yahweh; for Yahweh cannot be tempted with evil, nor does he tempt anyone . 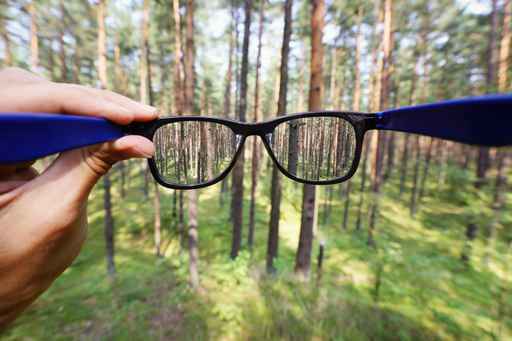 Many people are not able to see the result of the sin going on around them. Yet, the world is filled with people suffering from sins. However, when Yahweh calls them out and opens their minds to understanding the importance of His Laws, and they begin suffering, first hand, the hatred of carnally minded people who hate Yahweh’s Laws, then they are finally able to see the results of sin. They even come to despise Baal (the lord) just as Yahshua Messiah did. That is the reason the Apostle Shaul wrote that we are actually made perfect through suffering. They strengthened the minds of the disciples, and exhorted them to remain firm in the faith, and that we must, through much tribulation, enter into the Kingdom of Yahweh. Yahweh allowed Yahshua to suffer, in order to make Him see, first hand, the results of sin. It may be necessary that Yahweh will also have to let each of us suffer before we, too, fully realize the results of sin. Now let us compare Hebrews 2:10 to Hebrews 5:9. For it was fitting for Him—on account of Whom are all things and through Whom are all things, in bringing many sons to glory– to lead the Prince of their salvation to perfection through sufferings. Then being perfected, He became the causer of eternal salvation to all those who obey Him. Just reading the King James Version, one might think that (1) Yahshua was made perfect, and (2) that He was the author of eternal salvation. However, I want you to know that the translators of the King James Version lied to you. They, as well as all the false religious leaders in this world, want you to think that Yahshua pre-existed and Hebrews 5:9 is one of the Scriptures they try to use to prove their doctrine. However, there is quite a difference in the meanings of the verb forms: being made perfect and having been perfected. The translators, and deceived preachers who teach false doctrines, are the very ones who want you to also believe that Yahshua is the author of salvation. They want you to believe that the Plan of salvation was written by Yahshua, however, Yahshua is not the author; Yahweh is the author. The word translated author in the King James Version is word #159, from word #154, in Strong’s Greek Dictionary, and means a causer, to ask. We are also instructed to compare word #4441, in order to find the complete meaning of word #154. Word #4441 means strictly a demand of something due. Therefore, because Yahshua Messiah came to perfection, He received that which was His due: eternal life, and became the causer of eternal salvation to all those who obey Yahweh. 21 Make you perfect in every righteous work to do his will; working in you that which is well pleasing in His sight, as he did in Yahshua Messiah—to Whom belongs the glory forever and ever. HalleluYahweh! This day Yahweh has set before you life and righteousness, through the true Savior sent by Him, High Priest over The House of Yahweh: Yahshua Messiah. This day, there is also set before you death and evil through a pre-existent god savior who supposedly “did it all for you” if you “only believe,” even though you continue to practice evil. It is your choice. Yahweh, the kind, merciful and loving Heavenly Father asks that you choose life, through Yahshua Messiah, the true Savior sent from Father Yahweh. IN SEARCH OF A SAVIOR.